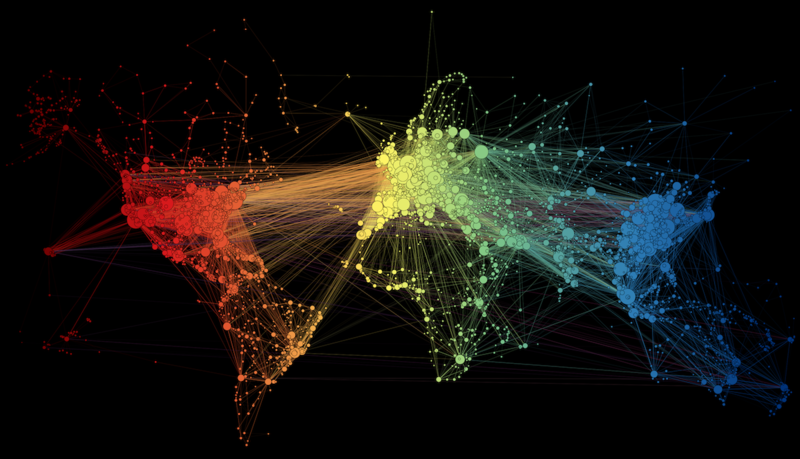 Share the post "Connected World: Untangling the Air Traffic Network"
A network, in its very essence, is already a map. 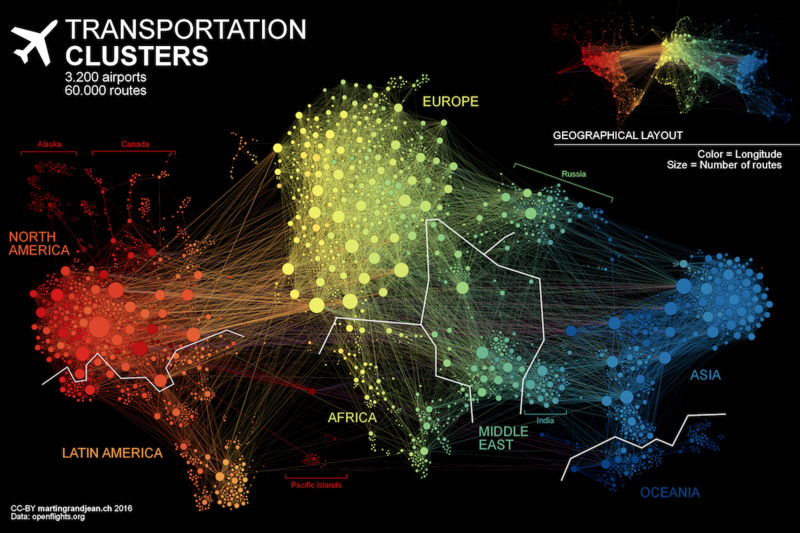 And the global transportation maps that represent the flight connections rarely make this network intelligible: on a world map, Europe is often a very dense area where it’s almost impossible to distinguish the dots/airports. Ultimately, these maps (sometimes very beautiful objects), do not represent the data itself, but some idea of the complexity and quantity. This post (which may be followed by further experimentations in this area) is an attempt to make explicit the network behind air transport. The structure of the relationships has an impact on the spatial distribution of nodes in a graph. Let’s see how this landscape is reorganized without geographical constraints. This “map” is the result of the application of a force-directed layout algorithm on a graph of 3.275 airports (37.153 single routes – the weighted total is higher because many airlines take the same route), based on OpenFlights.org data. Naturally, network geography is not completely disrupted: the continents are mostly visible and regions are generally in their original position (with the exception of the Pacific islands that connect Asia and America – imagine this graph in three dimensions, with the Pacific Ocean behind). Major observations: India is more connected to the Middle East than to South and East Asia. The Russian cluster is very visible, connecting airports in Russia but also in many former Soviet republics. Latin america is clearly divided between a South cluster and a Central American cluster very connected with the U.S. Bonus, the geographical layout of the same graph. 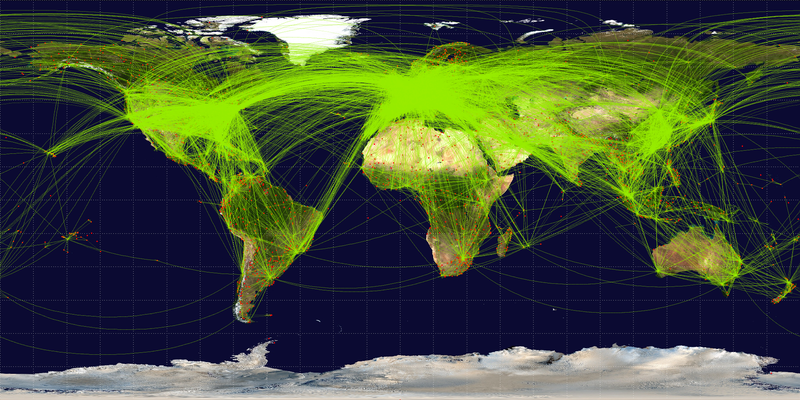 Shared by Matthieu Totet on Twitter: World flight routes worth to be seen! How did the Pacific Islands end up between Latin America and Africa? Every map is a 2D projection of a 3D reality. Here, the Pacific Islands are not "between Latin America and Africa" but "behind", as they are connecting Asia and America. On such a graph, the position of a node is not as important as its connections, and sometimes, when the node is connected to 2 others that are very far, its position will be in the middle between them. There are no connections between North America and Asia? That is a pretty big miss if you are representing this as a complete may for the given airports. Connections are displayed! But you're right, they are hard to see, especially on the geographical version (2nd here). The lines are purple. We talk about a network, which is the 2D projection of a 3D reality (on a globe). The connections between North America and Asia therefore pass "over" Europe (but in fact, they pass in the background, behind). On the geographical map (but this map was not the aim of this study), we generally draw these America-Asia lines leaving on the left side and then arriving from the right. But that's exactly the interesting point in network analysis: leaving this geographical fact to see if the 2 "poles" (red and blue, here) are attracted together to form a triangle with Europe (yellow). Result: no, the connections above Pacific Ocean are not sufficient to make these 2 clusters attract themselves more than the attraction of their intermediate European cluster. Note also that a there is hundred times more internal connections inside North America than from that territory towards Asia. What tool did you use to make these visualizations? Gephi? Pingback : El fascinante mapa que muestra las conexiones del tráfico aéreo en todo el mundo » Navegando del Pasado al Futuro. Pingback : Desembaraçando o tráfego aéreo – Update or Die! Belle production. Pourquoi y at-il pas de vols entre l'Amérique du Sud et l'Australie? Ou entre l'Afrique et l'Amérique du Sud? Ou entre l'Afrique et l'Australie? Ces vols existent, mais les routes sont très peu nombreuses (ça, c'est une réalité du réseau aérien) et également peu parcourues par rapport aux autres. Comme les traits sont pondérés en fonction du nombre de vols sur chaque route, ces traits sont parfois extrêmement fins en comparaison. Pingback : Das Luftverkehrsnetzwerk – goCart e.V. Love the representation. Is this available for use as a vector file? .svg .ai or similar? It would be great to make this larger without loss of fidelity? Love the representation. Is this available for use of connectivity raw data? Such as .csv file. Thanks.